An immaculately mowed lawn is the dream of every homeowner and when it comes to maintaining a larger lawn, push mowers may not be the best option. The solution when it comes to efficient lawn care comes from a small riding lawn mower. They are convenient, easy to operate, time-saving, and not too big to store and they make short work or medium-large sized yards. The XT1 Enduro comes out on top for both value for money and performance. Powerful yet easy to handle with responsive controls and small enough to perform more intricate cuttings as well as cover large lawns. Why You Need A Small Riding Lawn Mower? Riding lawn mowers come with immense benefits including convenience, efficiency as well as time savings. Compared to push lawn mowers, the ride on’s obviously cover your ground faster because they are engine-powered and only require you to maneuver the steering. You will spend half the time you would have spent behind a walk-behind mower. These units also come with wider decks and are built to tackle tough or wet grass with less effort. Small riding lawn mowers are easy to operate for both beginner and lawn care experts. 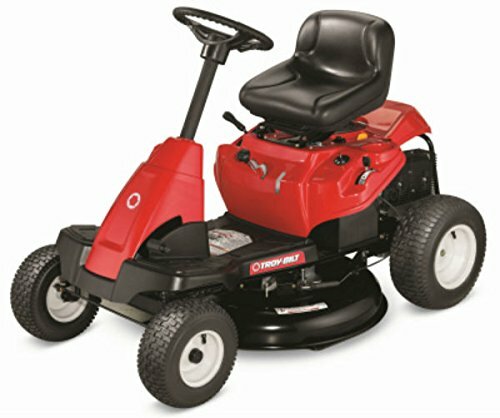 What To Look For In A Small Riding Lawn Mower? Well now you know what’s best for you, but the market is flooded with far too many mower brands it may take you ages to settle on the right one for your needs. Here are some factors you need to consider when selecting one. Since inception in 1837, John Deere has stood out as a quality outdoor equipment builder with their riding mowers targeting both small and large scale residential users. You can never miss their green and yellow distinctive brand colors. Troy Bilt mowers offer a combination of quality and affordability in their products for the residential users. Husqvarna constructs high-quality innovative mowers with a focus on ease of operation and targets the residential market in search of luxury. Riding lawn mowers have a higher risk of tipping over when mowing hills. Look for a riding mower with larger rear wheels to enhance its traction. In addition, an important tip with the ride-on is to mow when the ground is dry as most don’t perform too well on wet slippery grass. A higher maximum mowing speed means getting the job done faster. Further on, you will need to choose between single-speed and multi-speed mowers. Single speed riding mowers come with one fixed speed option and work best for an even terrain without obstacles. Otherwise, a multi-speed mower seems to be the most popular as it lets users choose from a range of speed options. the right deck width is not just about the size of your yard and how fast you want to finish mowing but also about storage and the engine power. It is also about efficiency. The wide 42-inch deck may be ideal for a large lawn but not for a large lawn with a number of landscape features, for instance, trees, poles, flowers, winding paths, which will need a good deal of maneuvering. In this case, you may consider a smaller deck perhaps between 28-34 inches because it will be easier for you to maneuver around obstacles. An even terrain requires less power compared to a rugged or hilly terrain. Small sized yards require a rear engine mount which is typically designed to work with smaller decks and lesser engine power of between 11 and 15 HP. This engine type is great for maneuvering especially for lawns with obstacles. Larger sized yards will need front engine mount designed for a larger deck size and greater engine power between 18HP and 26 HP. Blades: A dull mower blade can damage grass. Keep your mower blades sharp at all times to protect your grass and deliver clean cuts. Undercarriage: Clean the undercarriage of your mower after every use to prevent grass and debris from clogging. The tough clogs of grass clippings will need scrubbing with a wire brush. Otherwise, simply spray off the dirt with a hose. Engine oil: The engine oil level needs constant monitoring. Replace old or contaminated oil and remember to use only the recommended oil type for your mower. Air Filter: An air filter is an essential element for proper engine performance. Sometimes after long use, you may notice it is clogged and dirty. Clean the filters regularly and replace them at least once a year or when you notice signs of wear and tear. Nuts and Bolts: Before using your mower, check if there are loose nuts and bolts and tighten them so that your mower will be safe to use. Cub Cadet enduro series XT mowers focus on strength and performance. A common unique feature among them is their solid chassis designed to handle different engines, transmissions, and decks. The 18 HP professional-grade Kohler Courage OHV engine with 3 gal fuel tank capacity comes with several advantages. It is a single cylinder engine with a cast iron sleeve and is typically simple, compact, durable and will cool quite easily compared to multiple-cylinder engines. The engine is equipped with a fully pressurized oil pump w/spin-on filter for efficient lubrication. In addition, the smooth operating OHV design offers enhanced fuel efficiency and more torque per unit of displacement. The quick start and Consistent-Cut™ technology powers the deck to deliver a clean neat cut. The XT1 comes with 15-inch front wheels and larger 20-inch rear wheels to offer better traction. However, because it is a front drive unit, you can also expect enhanced maneuverability. These wheels are powered by the engine to a 5.5mph max forward speed and 3.1 mph max reverse speed which is rated above the market standard. The XT1 stamped steel spring-assisted cutting deck is designed with 42-inch twin cutting blades that will certainly deliver clean cuts to 12 cutting positions within 1 and 4 inches of cutting height. The deck has both front and rear anti-scalping wheels; 2 front ball bearing and 2 narrow rear anti-scalping wheels. Coming to the deck spindles at ¾ inches, they are designed with a steel cap and are triple lip sealed making them durable. The deck is also designed with a QuickAttach™ no-tool system for easy attachment and removal of accessories like a mulch bagger. The SmartJet™ high-pressure deck washing mechanism comes as an added advantage for an easy clean session of your mower deck once you are done mowing. The XT1 is designed with a high back-seat with a10-degree incline and sliding capability to give the operator an option to set the seat to a most comfortable position. It also comes equipped with a reverse safety switch for a quick simple switch to reverse drive and a brake pedal lock to prevent accidental release of the brake system which can be quite risky. The soft touch engagement cruise control lets you conveniently control the speed of the unit with the simple press of a button. Another feature worth mentioning is that this unit has been built to last thanks to its fully robotically-welded frame with the new e-coating corrosion defense system and a cast aluminum transmission housing. Finally, it is backed by a 5-year unlimited hours warranty for the chassis and front axle, 5-years limited lifetime fabricated deck shell warranty, and 3-year unlimited hours warranty for the entire unit. Cruise control system for easy automatic control of speed. LED headlights for enhanced visibility. Powerful 18 HP OHV engine. 3 years warranty on the entire unit only covers factory defects and not wear and tear. The Premium Neighbourhood riding mower is built for the residential user however, its power and performance make it stand out as a preferred small riding lawn mower. Some features that make it stand out include. The Troy-Bilt Neighbourhood rider is designed to meet the needs of the residential user but with exceptional power thanks to the 382 cc power more OHV 1.3gallon capacity engine with an Auto choke element to eliminate the need for choking or priming. This engine powers the 30-inch 14-gauge durable deck designed with 5 cutting heights, which is typical of a wide-cut walk behind mower that this units couples with the offerings of a riding lawn mower. This small deck along with an 18-inch cutting radius makes it easy to maneuver around obstacles and tight corners, an advantage it has over larger riding mowers. A manual power take-off is great for easy blade engagement. For grass clippings, this mower is designed with side discharge capabilities. It comes with a remarkable maximum forward speed of 4.25 MPH which can be adjusted to 6-speed settings from zero to the max forward speed and also features an operator-controlled reverse mowing system. 13-x5-inch front wheels and larger 16-x 16.5 rear wheels allow for better traction on hilly terrain. A comfortable adjustable mid-back seat and a 13-inch soft-grip steering are added comfort features that would set the difference in a user’s mowing session. Additionally, because of its compactness, it has little storage space requirements. If you are a homeowner with a standardly sized yard with an even terrain and a gentle slope, the Troy Bilt Neighbourhood riding mower makes a good option. It is backed by a 2-year limited warranty as a quality and durability guarantee. Compact and easily maneuverable reaching areas that larger mowers cannot reach. Sight window on the fuel tank offers an at-a-glance view of gas levels. Only has side discharge, lacks mulching and bagging capabilities. This small riding lawn mower by Poulan Pro comes with a slightly larger capacity compared to the Troy Bilt Neighbourhood lawn mower. It comes equipped with a Briggs & Stratton V-Twin Pro series 22HP engine with a 3.5-gallon fuel reservoir, to power the 46-inch stamped steel reinforced deck adjustable to 6 cutting heights within a range of 1.5 inches and 4 inches in ½-inch increments and its caster wheels to a maximum forward speed of 6 mph. Its deck features double blades to deliver a clean cut. The greatest advantage of a zero turn mower is that it makes 180-degree turns to cover every pass without leaving any patch of uncut grass. A noteworthy feature is its dual hydro-gear EZT transmission that lets you control each wheel independently with 2 levers with foam padded hand grips positioned on either side of the seat. These levers, depending on the direction you are moving them will move the wheels to the left, right, forward or backward. This is, in fact, the mechanism behind the zero-turn but beyond this, it facilitates easy maneuverability particularly around obstacles and a shorter mowing time as it eliminates trimming. This unit is fitted with durable 11-inch front and 18-inch rear caster wheels for enhanced traction and a welded frame as an assurance of durability. Comfort features include a 15-inch high-back seat, an easily accessible control panel, and an electric clutch for easy blade engagement. It also comes with a digital hour meter to monitor maintenance schedules, 3 anti-scalp rollers to protect your grass from scalping, and a nose-roller. The Poulan Pro P46ZX is backed by 3 years limited homeowner warranty on the entire unit and 10 years warranty on the deck. It makes a great choice for residential users requiring a power and durability for their medium sized lawns. Poulan Pro P46ZX offers one of the best maneuverability and this happens to be its greatest selling point. A large 3.5 gal capacity fuel tank. 10-years warranty on the stamped mowing deck is way above industry standard. Most users are more familiar with a steering wheel rather than bars when it comes to steering the unit. The Poulan Pro PP155H42 riding mower is definitely built for strength, durability, and performance thanks to the powerful 15.5 HP Briggs & Stratton Hydro-transmission system and 46’’ reinforced vented steel cutting deck. Below we shall analyze these features and others in detail. The 15.5 HP Briggs & Stratton single cylinder OHV engine that comes with an easy to use and maintain air filter and a patented ReadyStart® starting system for an easy start needing no choking and priming, powers this unit’s 42” vented reinforced steel cutting deck. A remarkable advantage with the cutting deck apart from its durable construction is that it draws air from the top to facilitate the circulation of air under the deck which is great for lifting grass for a clean one-pass cut. The deck blades are designed with 6 preset cutting positions to allow the operator mow grass to his preferred cutting height. The spring assisted cutting height lever allows for easy operator access when it’s time to adjust the cutting height. The Poulan Pro comes with mulching, bagging and side discharge capabilities. Anti-scalp deck wheels are incorporated on the deck to prevent scalping of the lawn, particularly when mowing uneven terrain. The convenient hydrostatic transmission comes designed with a CVT fast pedal drive system to facilitate an easy speed adjustment with the use of a motion lever takes the unit to a max forward speed of 8 mph. The 6-inch turning radius, made possible by the rotating cast iron front axle is small enough for enhanced maneuverability especially in tight spaces and turns as well as around obstacles so that you will be left with very little trimming to do after mowing. Additional comfort features include ergonomic design steering wheels to reduce fatigue, a wide enough step-through area for easy mounting and dismounting, and a built-in cup holder to hold your beverage and keep you hydrated throughout your mow. 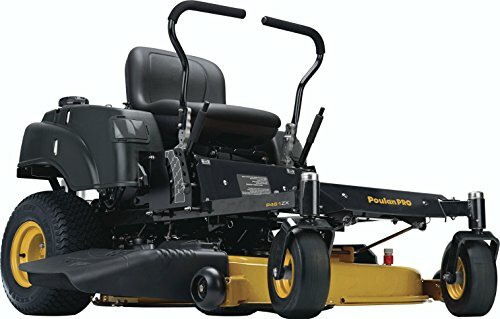 Poulan Pro 960420182 riding lawn mower is backed by 2 years limited warranty on the entire unit and 10 years warranty on the stamped mowing deck. Just like P46ZX model by Poulan Pro, this too comes with 10-years warranty on the stamped mowing deck which is rated above industry standard. Larger 20-inch rear wheels provide good traction. This is perhaps the first unit that we felt didn’t have much in terms of cons. However, its assembly is pretty detailed and will take you some time especially if you are a first time user. Huskee has been producing lawn mowers both for residential and commercial use with a focus on ease of operation and over time has built a reputation for quality and dependability on their units and the 420cc 42-inch riding lawn mower is certainly a reflection of these values. The following features make this small riding lawn mower an exceptional performer on your yard, particularly on a hilly terrain. The 4-cycle 420cc single cylinder OHV Powermore engine with 1.36 gal fuel tank comes integrated with a shift-on-the-go drive system for a strong performance and enhanced fuel efficiency and an electric start key for instant power up. Its 42-inch stamped 14-gauge steel deck comes with two blades and is powered to deliver mulching, side discharge, and bagging options. 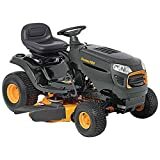 With an 18-inch turning radius, this riding mower can maneuver around obstacles quite easily plus the deck is incorporated with anti-scalp features to protect your grass from scalping. The lever operated auto transmission delivers a smooth ride and stability, especially on uneven terrain. It is designed with 7 preset shift-on-the-go speed options to steer it to a maximum forward speed of 5 mph. Compact size allows for easy maneuverability near obstacles eliminating the need for trimming after mowing. Does not have reverse mowing capability. Fuel tank capacity is small. Among the top 5 small riding lawn mowers, the Cub Cadet XT1 stands out as the best mower for obvious reasons. It is built to perform and for durability thanks to its strong stamped steel cutting deck and an 18 HP professional grade OHV engine. In addition, it comes with a large 3-gallon fuel tank capacity. With a 12″ cutting height setting, you are guaranteed precision. Another advantage is better traction. This unit is designed with wider larger rear wheels to make this possible. A small riding lawn mower is certainly better than the walk behind mowers especially for medium sized yards and will give you an easier and fun mowing time provided you get the right tool for your specific needs. Hi great article I recently bought the Troy Bilt TB30R and it came with a mulching plug kit. You might have improved things greatly by defining what you mean by “larger” and “smaller” yards.